The weekend started particularly well with the J14 boys. The J14A quad showed their skill and determination pulling through from behind to win their final in the last 150m and the J14 octuple powered to a victory in their event. The winning ways continued with the WJ14 quad of Georgia Brown, Freya Jonsson, Amber Weller, Hazel Drury and cox Ella Shute who won by half a length against Lady Eleanor Holes School in a well fought final. The J15 boys double of Balti Issa and Ollie Taylor stepped also won a close race that brought out their fighting spirit. 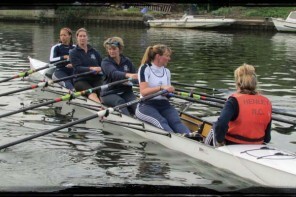 The real triumph for the club however came from HRC J16 girls quad. This crew of Tilly Lock, Mary Wright, Georgina Robinson-Ranger, Charlotte Orr has grown from strength to strength this season. 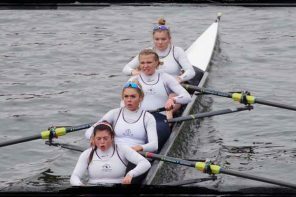 Having already dominated their event in the National Schools Regatta, they once again showed their skill in a convincing win at Henley Women’s Regatta. They took the Nina Padwick Trophy beating Llandaff, then Nottingham and then Headington in the final. Each win was by more than two lengths with in the final seeing an even more convincing victory, beating Headington by no less than four lengths. 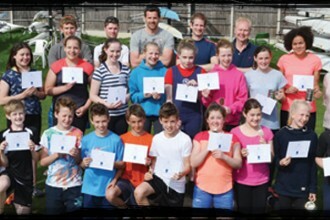 At the other end of the spectrum, Henley’s Master competed on the 15th June at the British Rowing Masters Championships at the Holme Pierpont’s Watersport Club in Nottingham. On Saturday a Womens Masters E crew of Helen Knowles, Linda Thomas, Valerie Bennett and Helen Turnell competed in the Womens E quad event, Henley finished third in their heat to qualify for the Final. In a very close race Henley just missed out on a medal, finishing in fourth place. On Sunday Rob Wilson and Mike Jennings were treated to a classic example of Holme Pierpont’s micro-climate, racing a heat in perfect conditions – dead-calm and warm, whereas a strong headwind and heavy rain greeted them for their final. Wilson and Jennings were able to establish an early lead, that they maintained throughout the race, to win Veteran D pairs for the third year in succession.